The ability to test and find the location of steel reinforcing, post/pre tensioning, or conduit in concrete, or to measure the dimensions of a concrete element. Applications could include drilling a penetration (core) into a concrete slab, measuring the thickness of a slab or measuring the length of a pile. There is some overlap with Ground Penetrating Radar systems. PCTE sell a large range of equipment that could be used for these applications. Technologies that could be employed include impact echo, ultrasonics or ground penetrating radar. We can advise on what would be the best method dependent on the application, the access and the desired accuracy. 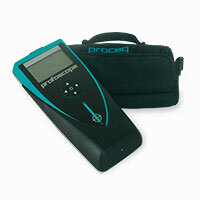 The ProfoScope cover meter and rebar locator is the base level device available from Proceq. 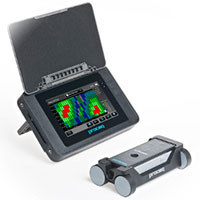 The ProfoScope employs the best technology available to accurately locate reinforcing steel and to measure their depth (cover). Proceq's most capable cover meter. Class leading data logging records detailed cover and bar diameter survey, with full statistical interpretation right on the new touch screen readout. The durabar Cover Meter is used to detect reinforcing bars near to a hole drilled into a concrete structure. 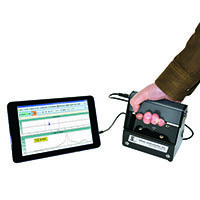 The system is a handheld battery powered unit with a 10 mm diameter probe. 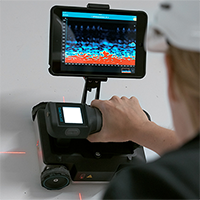 Non-destructive, battery-powered handheld systems for measuring the thickness of concrete slabs, pavements, tunnel linings, walls and simmilar. The CTG is also suitable for shallow foundations. Sonic Echo / Impulse Response (SE/IR) investigations are performed to evaluate the integrity and determine the length of deep foundations. 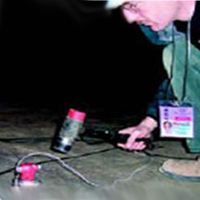 Parallel Seismic (PS) is a method that is applied to determine the length of deep foundations where foundation tops are not accessible, or when the piles are too long and slender to be tested by Sonic Echo techniques. Ultra-seismic (US) investigations are performed to determine the length and evaluate the integrity of shallow and deep foundation elements. 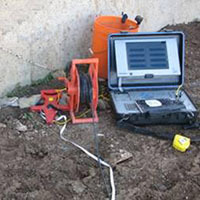 This investigation technique is suitable for a variety of structures, from shallow wall-shaped substructures, to deep drilled shafts. Ground Penetrating Radar is suitable to locate reinforcing steel, post tensioning and other embedments. 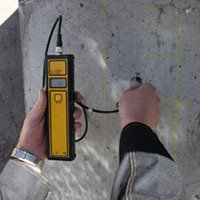 It is also suitable to determine the thickness of concrete slabs.